Male head probably broken from a seated sculpture. Finely braided or wavy combed hair tied into a double bun on the back of the head and a plain fillet or headband with two hanging ribbons falling down the back (40). The upper lip is shaved and a closely cropped and combed beard lines the pronounced lower jaw. The stylized almond shaped eyes are framed by long eyebrows. 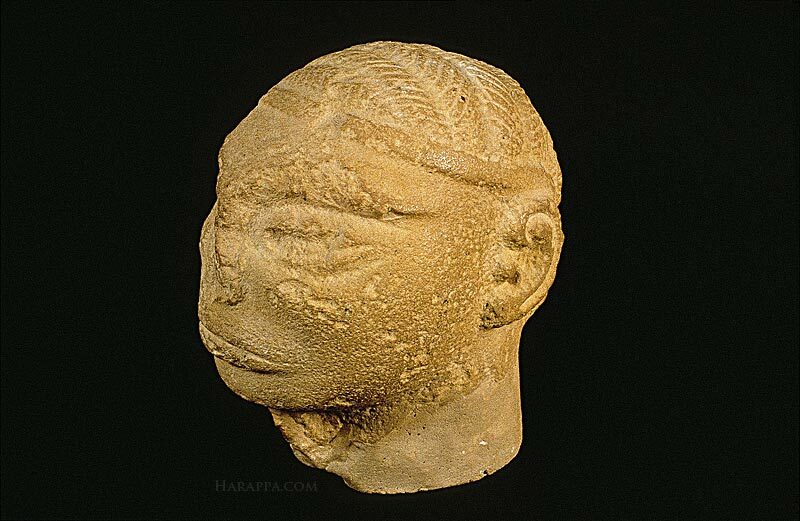 The wide mouth is very similar to that on the "Priest-King" sculpture. Stylized ears are made of a double curve with a central knob.